Happy Friday, all! When I first started creating shaker cards a few years ago, it was a bit intimidating! But I’m here today to show that shaker cards are super fun and EASY! By breaking it down to a clean and simple design, I hope it makes shaker cards more approachable. I think shaker cards make the perfect birthday cards! So when I saw Studio Katia’s Satin Rainbow Confetti mix, I just knew I had to create a birthday card! 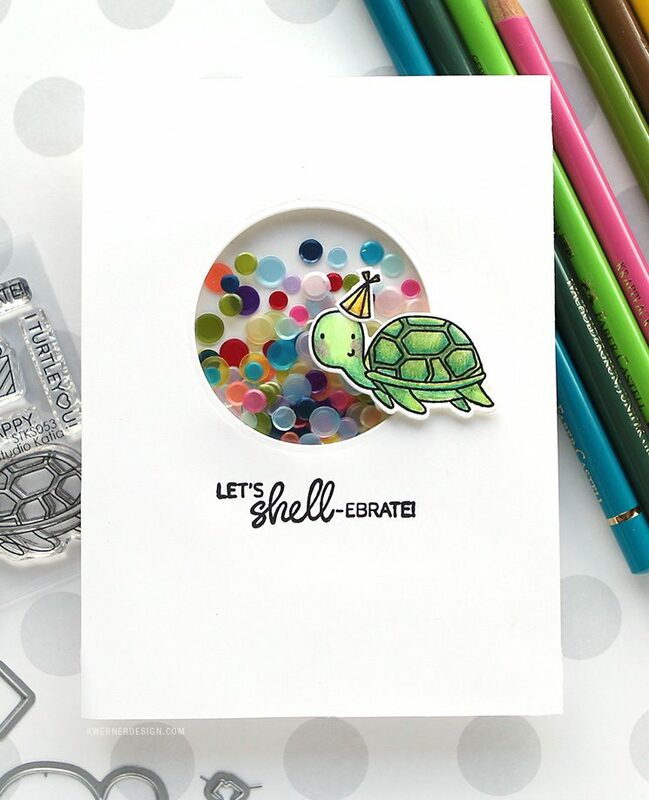 The new Shellebration stamp set worked out perfectly, too. 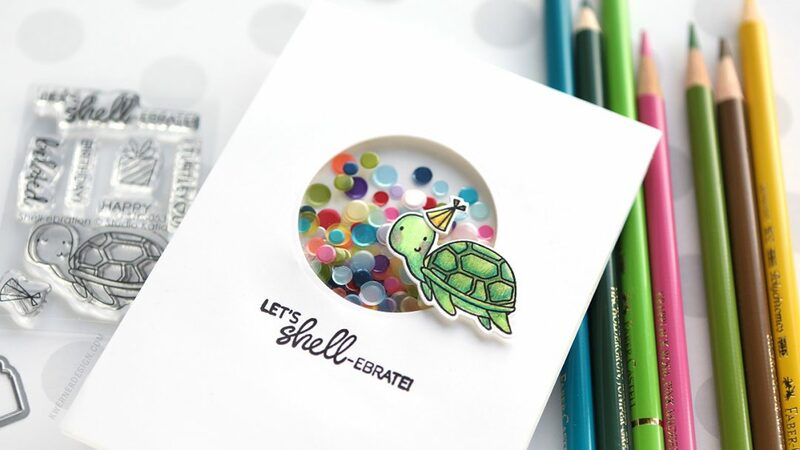 Isn’t that little turtle with the party hat so cute? The key to keeping your shaker card super easy, is to use foam tape, double it back on itself, and then remove the release paper from both sides. This allows the foam to bend and morph to the exact shape of your shaker window. Once I heard of this tip (for a reader, too! ), it completely changed shaker cards for me. Suddenly, shaker cards were so easy! The frustration of creating the shaker area was eliminated. I hope you enjoy today’s video! Thanks for stopping by! 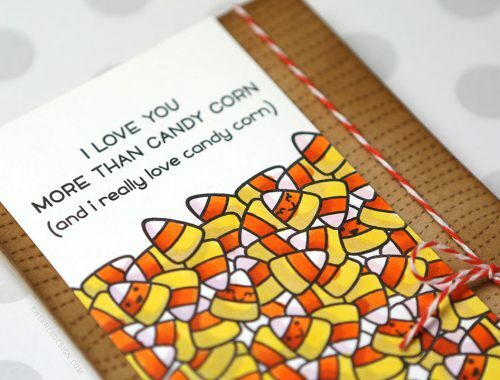 Today’s post is also part of a blog hop celebrating Studio Katia’s 2nd Anniversary! You can check out their entire new release here. 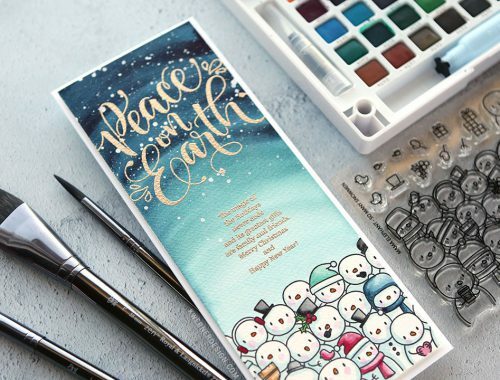 Studio Katia also has a giveaway for the blog hop–which is a two day blog hop (check out the entire blog hop celebration here)! Studio Katia is giving away TWO $100 CAD gift certificates on each day of the hop. Winners will be chosen from the comments left on all blogs of the hop! So be sure to leave a comment at all the stops to increase your chances of winning. You have until Saturday, June 2nd, 2018 11:59 PM EST to leave comments. All winners will be announced on Sunday, June 3rd, 2018 on the Studio Katia Blog. Now it’s time to get hopping! Your next stop is Emily Midgett!